no phones, no kids, no work, no dishes , no cleaning or making beds! Treat yourself to a sewing retreat weekend in our Beautiful restored 1900's dairy barn. Get your sewing group of 20-22 together and have the whole place to yourselves! A Single room may be available for people who want a room to themselves for an additional charge. ($529) Otherwise you will be rooming with the person(s) that you indicate on the registration form. $279 per person, if PAID in FULL at time of registration. Otherwise, a deposit of $100 is required to reserve a space and balance of $209 will be invoiced via e-mail and must be paid 90 days prior to arrival. In very simple terms --you save $30 to pay in full when you register. Click here to see all room descriptions and photos. Open Sew weekends will require you to bring your sewing machine, projects and supplies. Please indicate on the registration form who you will be staying with so we can put you in the same room. 4 rooms have two twin beds and would sleep 2 people. 1 room has a full size bed and could sleep two people. 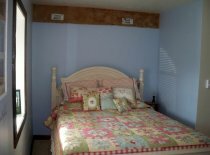 1 large room has a queen bed and two twin beds and would sleep 4. 1 very large room has 5 twin beds. Clean sheets with a zippered encased pillow protector, (you are welcome to bring your own pillow), A lightweight polar fleece blanket, and a cozy quilt. Towels and facecloths are provided in the bathrooms and will be laundered each day. Liquid shower soap and shampoo are in the showers. You will need to bring all other personal toiletries. Enjoy your meals in our large 20X40 open kitchen - dining area. The meals provided will be catered in and available at specific times each morning and lunchtime. We will provide bottled water and coffee throughout the day. Other drinks , please bring your own. Cancellations received 90 days or more, will receive a full refund. A cancellation received 4-30 days will have their full payment applied to a future weekend reservation. A notice of cancellation received within 72 hours upon date of reservation will result in no refund.